Died: 4th April 1915; age 43 – at Herman de Stern Home, Felixstowe, Suffolk. 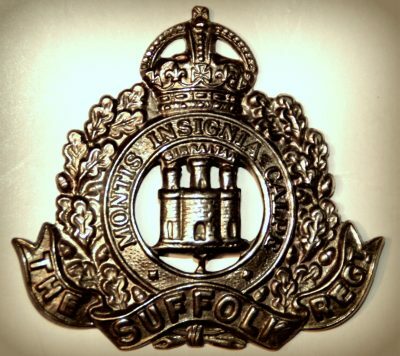 Regiment: Suffolk Regiment, 3rd Battalion. Relatives Notified & Address: Son of William & Susan Crickmore, of Ipswich. William was 8 years old and living with his parents & siblings. William Crickmore, 31, a General Porter – Ships, born Ipswich. Susan Crickmore (nee Cannell), 28, born Ipswich. Lucy Crickmore, 10, born Ipswich. Alfred Crickmore, 7, born Ipswich. Henry Crickmore, 5, born Ipswich. John Crickmore, 2, born Ipswich. George Crickmore, 10 months, born Ipswich. 1891 Royal Victoria Hospital, Military Station, Netley, Hound St. Mary, Hampshire. William was 18 years old, a Soldier ranked Private for the Medical Staff Corps. William’s father, William Crickmore died 1892, Ipswich. Soldiers’ Effects to Susan Crickmore – mother, Henry Crickmore & John Crickmore – brothers, and Lucy L. & Catherine – sisters.